Food for Thought is this amazing little vegetarian restaurant in Covent Garden, which has existed for over 30 years. Have you been there? 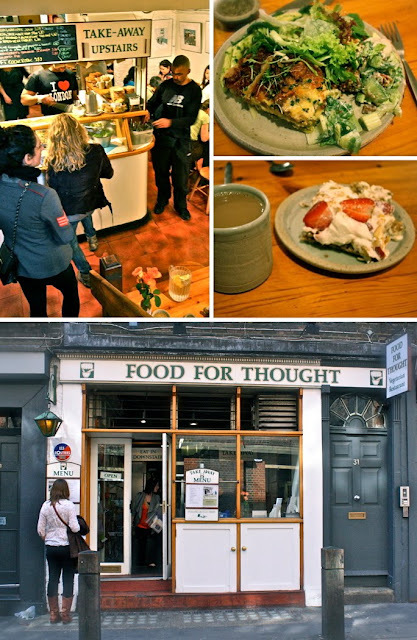 We have this little tradition that every time we have a several hour long layover at Heathrow airport, we dash off to central London on the tube and go for lunch at Food for Thought. Believe me, it's worth the effort. The cozy, humble restaurant feels like home to us, and the staff are always happy & smiling. I love it how everyone shares the tiny tables and socializes... as it seems to attract like-minded, friendly people. And the food, oh the food, is incredible... and it just happens to be vegetarian... which is totally my veggie food philosophy (amazing taste & effortlessly meat-free). Also it's affordable, which is great because I can never resist the dessert (especially the Scrunch), no matter how full I am. I wish I had read this blogpost before I went to London last month as I spent a little while in Covent Garden!!! There is always a next time! !